Levi Strauss Sewing Up the iPod Market? "iPod owners might be daft fashion victims who are easily parted from their money, but they are not thieves, despite what Steve Ballmer may, or may not, have said. "A survey of US and UK music buyers reveals that although 25 per cent of people admit to downloading music from file-sharing services, only seven per cent of iPod owners do so. Proving that iPod users are either scrupulously honest or more paranoid they'll get sued by RIAA than owners of lesser music players." "A week after Microsoft and MTV pitched the Urge.com rival to iTunes, Apple Computer upped the ante in online entertainment and services. "Apple's chief executive Steve Jobs opened San Francisco's Macworld announcing an iPod deal destined to put iTunes in 40 per cent of US cars, additional content for the latest iPod, and escalating market uptake and sales. "Jobs additionally unveiled software tools that simplify development and hosting of web sites incorporating podcasts, blogs and RSS on Apple's .mac internet service. "US car giant Chrysler will integrate Apple's iPod with three million cars and Jeeps in the US, taking iPod out of its current luxury and European car niche. More than 40 per cent of US cars sold in 2006 would feature integration with iPod, Jobs claimed." "Fujitsu will start producing 1.8in hard disks through a partnership with Cornice, a US manufacturer of small format hard drives for consumer electronics devices. "The company will start by developing a 120 Gb [editor's note: we assume the author means GB] model scheduled for release by 2007. Fujitsu is entering a market currently dominated by Toshiba. 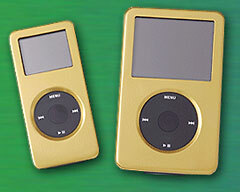 "Small hard drives are widely deployed in portable media players such as Apple's iPod. Other applications include digital video cameras and ultra-portable notebooks." "There was a time when 'high-tech apparel' meant clothes that were coated with some slick substance to ward off wrinkles and deter ketchup stains. Now, with the skyrocketing popularity of Apple Computer's iPod digital music player, some clothing companies are upgrading the tech factor in their threads. "San Francisco-based Levi Strauss, for one, expects to launch its Levi's RedWire DLX jeans this fall. 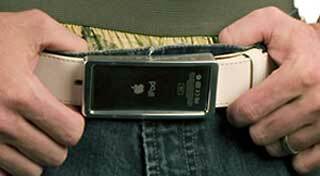 Designed to work with the iPod, the $200 jeans have a 'docking station' in a pocket where the wearer plugs in the device. A control panel sewn directly into the area where most jeans have a coin pocket (at the right hip), means wearers don't have to continually take the iPod out of a pocket to adjust the volume or locate a song...."
"A University of Leicester psychologist has concluded that modern listeners don't value music as much as their 19th-century counterparts did - and he blames the iPod and music downloading. "The results: participants are highly exposed to music; they listen to more pop than classical, jazz or other forms; they tend to listen when they're on their own; they tend to hear more music at home than in public; music was usually experienced during the course of some activity other than deliberate music listening, and - guess what - 'liking for the music varied depending on who the participant was with, where they were, and whether they had chosen to be able to hear music'." "However, equally baffled but more cost-conscious consumers are already availing themselves of the free iPod courses Apple itself runs in its Regent Street store, about 15 minutes' walk from Selfridges' Oxford Street site." PR: Missed out on Macworld Expo this year? Let iPod Garage bring you the Expo through our EXPOBOOK, the free downloadable 49-page book containing everything we learned about the iPod universe at Macworld Expo. Includes up close and personal hands-on looks at newly announced iPod-related products from Apple and third parties, detailed coverage of the iPod-related workshops and seminars, and hundreds of photographs of all of the above. Download the free 2006 EXPOBOOK now for a detailed look at what all you missed out on this year, as well a look at the kind of experience you can expect as an iPod user if you attend Macworld Expo in future years. PR: TuneBuckle is a unique and innovative way to protect and transport your iPod nano. Made from high grade metals and leather, you will never be without style or rhythm. PR: Attach TuneCenter to your television and stereo for viewing photos, watching video, listening to your iPod music library or internet radio. With the included 14 button remote, TuneCenter turns your iPod into a complete Home Media Center. Just dock the iPod into TuneCenter, and let the entertainment begin. Among TuneCenter's innovations is the ability to display iPod playlists and song information on your TV screen. TuneCenter takes music sharing to a whole new level: now the whole room can see at a glance the song title, artist, album and progress of the current song. TuneCenter's remote allows navigation of the entire iPod library, as well as preferences such as shuffle and repeat modes, and EQ. Use TuneCenter's remote to fast forward, rewind, choose next/previous song, browse playlists etc., all without getting up off the couch. This breakthrough is the ultimate solution for taking full (remote!) control of your iPod. Need more music? No problem. TuneCenter also plays internet radio stations. Choose from thousands of free channels ranging from quiet atmospheres to things that don't technically qualify as music - your call. Just plug TuneCenter into your network. If you have a wireless access point, you can stream audio wirelessly from the internet. And you can do it all with on-screen navigation. Very cool. TuneCenter makes even better use of your TV screen than just the ability to display song lists. Use TuneCenter to display your iPod's photos on the large screen. This is television REALLY worth watching: your own works of art. Display slideshows of your latest vacation, special events etc. Take TuneCenter with you for the most compact business presentation system ever. Simply choose a slideshow and soundtrack and let 'er rip. TuneCenter's remote keeps you in control. When it comes to watching movies, the bigger the better. Your iPod with video is the best way to carry your movies around; but the best place for watching movies and video is on your home entertainment system. Tap the full potential of your video collection with TuneCenter, all at the touch of a button. Fast forward, rewind and pause from the recliner. Bring iPod home with TuneCenter. PR: GizMac, known for their XRackPro Noise Reduction Enclosure for Apple Xserve and Xserve RAID systems, debuts the new Titan iPod Video case at the MacWorld Exposition in San Francisco. The new Video iPod case is part of an emerging line of accessories for the Apple platform and the Titan is on display in booth #2211 at MacWorld. 'Cause' Everyone Wears Their iPod Differently' is the motto of the Titan case for a good reason, the included carabiner clip, arm band, belt clip with 360 degree rotation for vertical, horizontal or any position in between and lanyard accessories provide a wide range of ways to wear the iPod Video. The Titan goes even one step further with the ability to easily change whether the top or the bottom of the iPod Video faces upward or downward, providing unmatched flexibility. PR: Long Island-based Think Different Store has added to its aluminum line of iPod protection with the introduction of its Aluminum Case for 5G iPod. The case is available in two colors: Silver and Black; two sizes: 30 GB and 60 GB; and also comes with an optional belt clip. 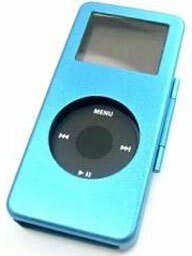 The case which sells for $24.95 is strong, sleek and provides a perfect fit for the iPod video. 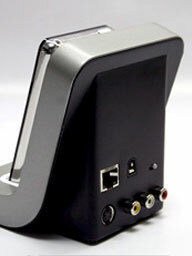 Cutouts offer access to iPod's dock connector port, clickwheel, earphone jack, and hold switch. And here's more "heavy metal" from TDS: Aluminum iPod nano Case available in four colors: black, silver, red and blue. Comes with an optional belt clip and lanyard. Price $24.95. PR: CyraKnow has announced the March launch timeframe of its newest Rambler audio phrase books created specifically for iPod-savvy travelers. The company designed the four new Rambler audio phrase books in Arabic, Japanese, Korean and Mandarin specifically for iPod use with the intent of helping new and seasoned travelers learn the nuances of pronunciation and basic phrases for each language in a short period of time. The company currently offers Rambler audio phrase books in French, German, Italian and Spanish. The Rambler audio phrase books are priced at $19.95 separately, and $49.95 for four languages. Each phrase book will include over 900 words and phrases recorded by a native speaker, as well as a printable PDF of popular sites and attractions for major cities in each country. Each language is interactive and organized into categories such as travel, food, and lodging to make the search process easier, and is designed to help travelers find the word or phrase they need through two clicks on their iPods. Each phrase book varies in size, and the largest is 80MB. Rambler is compatible with Mac OS X 10.2, Windows 2000 or XP, iPod (dock connector and click wheel models), iPod mini or iPod nano. CyraKnow was founded by Jeff Carns and Jeffrey Gonsalves in January 2005. These are the second Rambler foreign language tools designed by the company. PR: Download your favourite RSS and Atom news and blog feeds to your iPod. Read them anywhere. A small and simple utility for downloading RSS feeds to your iPod. Requires an Apple Macintosh running OSX 10.4 Tiger or OSX 10.3.9 Panther. 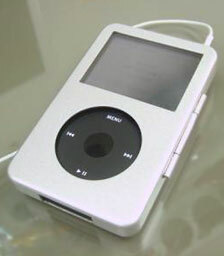 Requires an iPod,iPod mini or iPod nano with Notes facility. RSS is a way of presenting the contents of news or news-like sites such as Wired, the BBC, Slashdot or personal blogs. Look out for the orange XML or RSS buttons on sites that are RSS compatible. RSS-aware programs called news aggregators check your list of RSS feeds and display new items from each. News aggregators usually run and display on your computer, but iFeedPod collects all the news from your feeds, and copies them to your iPod for you to read wherever you have the time. PR: So you got the new video-enabled iPod. You've got your own movies. Why can't you watch them on your new iPod? MoviePod saves you the trouble of having to manually convert your movies in order to play them on your iPod. With MoviePod, converting a movie takes a single Drag & Drop! MoviePod can automatically add converted movies to a playlist of your choice and update your iPod. You can queue up as many movies for conversion as you like and when you return, MoviePod will have them all ready to go on your iPod. MoviePod supports every common movie format* (MOV, MPG, AVI, ASF, WMV, VOB, DV and QuickTime plugins) so you can easily get your movie collection onto your iPod! If you're like most iPod users, you have spent a good deal of time and expense building your digital music collection. Ripping CDs into mp3 files is something most people only have the patience to do once. And what about the songs you have downloaded? Songs purchased from the iTunes Music StoreÂ® can only be downloaded one time and must be re-purchased if lost. If your computer is stolen, broken, or infected with a virus, is your music safe? Your iPod Is Your Backup You already have a backup copy of your music - on your iPod. But iTunesÂ® only allows you to copy your music in one direction - from your computer onto your iPod. It won't let you make a backup copy of your music from your iPod onto another computer. That is exactly why you need Backstage. Backstage lets you quickly and easily copy your music from your iPod onto any Mac or Windows PC. * In addition to being the perfect insurance policy for your digital music collection, Backstage also lets you manage your music library easily and conveniently. Like your iPod, Backstage works equally well with both Macs and Windows PCs. When you purchase a license for Backstage, you can use your serial number to install Backstage on up to five (5) compatible computers. Your 5 licensed installations can include any combination of Mac or Windows PCs. You get both versions for the Special Introductory Price of $9.99. ** Backstage does not remove or otherwise alter the FairplayÂ® Digital Rights Management controls embedded in content purchased from the iTunes Music Store. Fairplay currently allows purchased content to be installed and played on up to five (5) computers at one time. Unprotected mp3 and video files can be freely copied for personal use without restriction.